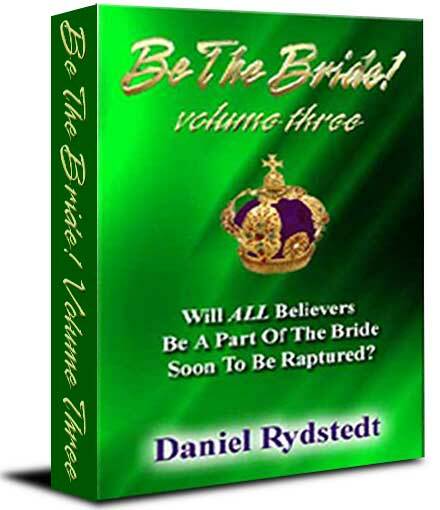 NOTE - My FREE Prophecy Book is no longer available at rapturebride.com. Please help me spread the Word that the new site is rapturebride.info. Encourage every Christian you know to come here to download the book. Bear with me when you see pages under construction, as I have had to build the site all over from scratch. Thank you ahead of time for your patience. Because of the lateness of the hour, I intend to make this site even better and include a blog to encourage all believers that visit. The Bride of Christ will be raptured in the not too distant future. Will all born again believers be taken as the Left Behind books portray? Or will the soon to be raptured Bride be comprised of a relatively small group of Christians who are obedient, faithful and totally in love with their groom, Jesus? The shocking truth is scripturally documented in this amazing book . . .
Because of the importance of this end time message a special online edition of this book is available for all to download free. One of the major focuses of this book and our ministry is to give a wake up call to the Body of Christ, exhorting them to Be The Bride. This amazing book has changed thousands of lives. Time is of the essence. Read it today! To register to get your copy click HERE. Please help us get this vitally important message to more Christians while there is time, by downloading the "Wedding Invitation" tract, printing it and handing out to every believer you meet. Learn more about Daniel . . . his ministry, his background, his mission, his music and most importantly, his message . . . and how your church can schedule a concert or seminar. For more information click HERE. This site is a work in progress. Items will be added on a weekly basis so bookmark . . .
. . . and check back frequently. There are thousands of items that will gradually be added over the upcoming months. The bookstore is organized with books listed in many appropriate categories and subcategories to make browsing easy and fun. There will be a sale on all items in a different particular category of books every month. In addition, you can qualify to receive free books with your purchase. When you shop at this site you are helping us get the Be The Bride message out to more believers throughout the world. I know that there are many believers that are struggling with their finances. I put together something that could be a great blessing to many who are in that position. I call it my Money Machine Team. When I put this together I wanted to find two or three programs that could generate several streams of residual income that could be created by spending as little as an hour or two working from your home computer. I wanted to include businesses that were solid and required no sales ability, no risk and a very small investment (only $10 for each of the two engines). What I found was so exciting that I put together a Money Machine that is amazing. I wrote a 67 page book that puts forth a vision, that if you see it, will keep you up at night. I want you to have a FREE copy of an ebook that I have written entitled, How To Create A Money Machine That Pumps Out Cash Even While You Sleep For The Rest Of Your Life! If you catch this awesome vision put forth in my book, I want you to join the Money Machine Team. I will give you every tool you need to be successful. You will receive absolutely FREE, a copy of my book customized with your affiliate links that you can give out to build your business . . . personalized bi-fold business cards, . . . personalized posters, . . . a website that is identical to mine customized to give away your ebook, . . . a customized banner, . . . video training from 2 free marketing systems, . . . as well as my help or advice and much more! You have nothing to lose and thousands of dollars coming in every month for the rest of your life . . . to gain. To download my book absolutely FREE and be reading it in the next few minutes either click on the banner above or click here..